The cable “news” network that has distinguished itself as the most fawning propagandist of the Era of Trump is without contest Fox News. It’s programming and personalities are shamelessly sycophantic, disgorging White House propaganda 24/7. Sean Hannity is even being referred to as Trump’s “shadow” chief-of-staff. That’s when he isn’t being associated with alleged criminal activity and real estate fraud. But perhaps the most the beleaguered host on Fox News currently is Laura Ingraham. 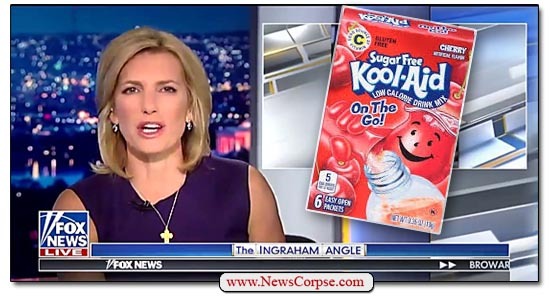 After attacking a teenage survivor of the Parkland school shooting, Ingraham has lost most of her advertisers and is hanging on to her job by the sheer stubbornness of the network bosses. “When will they learn? More than a year into Donald Trump’s first term, you’d think that all the Republicans would understand that the only way forward is to unify behind his agenda. It’s resonating with the American people. It’s bringing international foes to the negotiating table. And it’s having a positive impact on the economy. But some Republicans cannot help but lend aid and comfort to the President’s political enemies. You hear that Republicans? Get in line and stop thinking independently and representing your constituents. Your only duty is to follow the approved doctrine of the Trumpiate Politburo or keep your mouths shut if you can’t pledge unyielding loyalty. Ingraham’s call for blind fidelity to Trump is the sort of demand that is generally made by entrenched dictators. She is advocating a perverse brand of patriotism that flows through this administration. Just yesterday, White House press secretary Sarah Huckabee Sanders offered her version of this faith-based Trumpism by asserting that total dedication to Trump is synonymous with patriotism. She said that “Democrats have to decide whether they love this country more than they hate this President.” In Sander’s view people can’t simultaneously oppose Trump and love America. In reality, people oppose Trump “because” they love America. In addition to Ingraham’s command for compliance, she offered some reasons to persuade the supplicants. But each one was more ludicrous than the one before it. Trump’s agenda is absolutely not resonating with the American people. He is the most unpopular president in modern times. His policies are soundly rejected by wide majorities of voters. 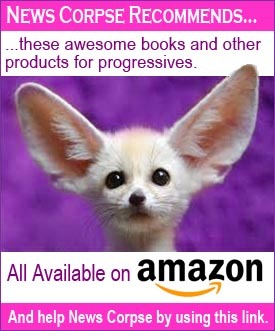 That’s why most political analysts are predicting a “Blue Wave” at the polls in November. Ingraham’s assertion that Trump is bringing international foes to the negotiating table is a fantasy. His administration has not achieved a single foreign policy goal in over fourteen months. And her praise for the economy is striking on a day that the markets suffered a huge drop, and the Dow presently sits over 2,000 points below it’s high. Not surprisingly, he hasn’t said anything since. In just the past week his approval rating has declined three points to forty-eight percent, with fifty percent disapproving. And his “strongly disapprove” numbers have been higher than his “strongly approve” numbers throughout his presidency, with the exception of a few days in the first month. And remember, this is according the right-wing pollsters at Rasmussen. Given the reality of Trump’s dreadful and despised tenure, asking people to unify behind him is like asking people to board the Titanic after it hit the iceberg. But that’s Ingraham’s position, and God bless her, she’s sticking to it. Tuesday evening at the White House, Donald Trump will host his first state dinner. The guest of honor will be French President Emmanuel Macron. The rest of the guest list is apparently a state secret because the White House is refusing to release it in advance. However, the identity of one notable guest has been uncovered, and it shouldn’t surprise anyone. 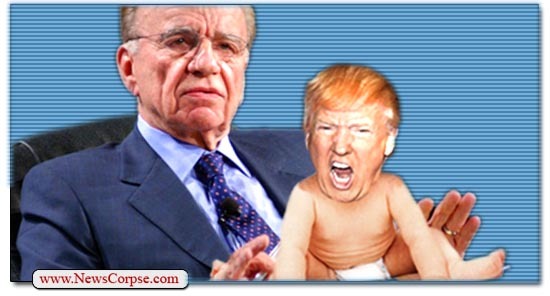 Rupert Murdoch, the Chairman and CEO of Fox News’ corporate parent, 21st Century Fox, named himself the top executive of the cable network after Roger Ailes was terminated for serial sexual harassment and abuse. 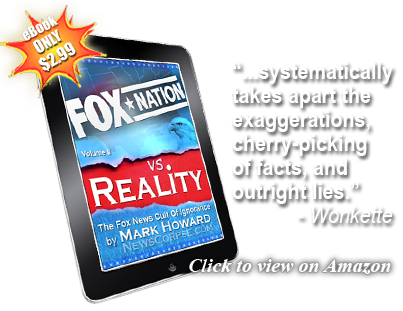 His stewardship of Fox News has devotedly advanced the political aspirations and agenda of Donald Trump. So being the recipient of one these scarce invitations was easily predictable. In fact,, he may have ordered Trump to issue it. After all, Fox News virtually invented Trump’s political persona and provided the media boost he needed to get elected. Anyone watching Fox for more than a few minutes will notice that their hosts and contributors are fawning disciples of Trump. But even more troubling is that Trump’s policies and public statements are almost entirely derived from what he sees on his favorite Fox programs. From when he first wipes the sleep from eyes in the morning to when he lays his head down at night, Trump is cramming it full of the Fox Doctrine. Fox and Friends serves as Trump’s daily presidential briefing wherein he learns what topics he is supposed to cover for the day and what positions to take on those topics. And Sean Hannity provides Trump the unhinged fury he needs to attack his political enemies. Hannity is so close to the President that he has been called the “shadow” chief-of-staff. And of course, numerous former Fox News shills are now on the White House payroll. He @BarackObama invited his top campaign bundlers and donors to the British State Dinner http://t.co/Zou6q9Q2 So corrupt!